On this page is a special selection of lessons that contain powerful vocal techniques advice. Take your time to browse and discover new dimensions to your singing that you never knew existed! One of the most important vocal techniques you can learn is how to sing your higher notes without your voice "falling apart". If you can discover your upper vocal range and be able to comfortably sing there, you'll really have what it takes to mesmerize the audience with exciting high notes. But without the right instructions it can be difficult to hold these notes together without either straining for them (and sounding terrible! ), or having your voice fall apart and go into a weaker sounding falsetto. ... without having to strain or reach for your notes. Pay close attention as there are very valuable vocal techniques in the video! There's only one way you can develop strength and power in your voice (without damaging it). Read this report to find out how to develop a strong powerful voice. 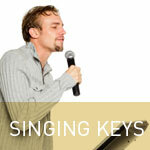 What are the three keys to singing that will help you develop your voice to the fullest? Find out in this short but important article. Basic Vocal Techniques To Get You Started The Right Way! Singing Lessons Online That Work?